This page provides you with practical information about our practice. It includes descriptions of our office location, including a link to our map and directions, hours, appointment scheduling, insurance acceptance and billing policies. Our office offers a fast and convenient patient-friendly scheduling policy. We offer same day appointment scheduling , as well as direct referral for scheduling endosopy procedures. Contact our office for further details. We are fully handicap accessible. 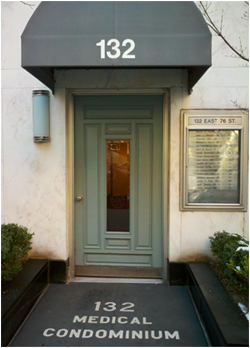 The office is conveniently located in Manhattan's Upper East Side directly across the street from Lenox Hill Hospital. We are easily accessible by public transportation from the 77th Street subway stop on the Lexington Avenue 6 line. Our office offers full gastroenterology specialty as well as complete primary care services. Our practice incorporates the latest in state-of-the-art equipment designed around patient safety, privacy and comfort. We offer full gastroscopy and colonoscopy services in our new state-of-the-art ambulatory endoscopy center, Manhattan Endoscopy Center. The endoscopy center is dedicated to providing high quality healthcare services, patient care and operational excellence. Located on 44th Street between Fifth and Madison Avenues, the site is easily accessible by all forms of transportation. The facility has been designed to maintain personalized attention while ensuring hospital level safety standards. The expanded size, amenities and staff of Manhattan Endoscopy Center assures quick, comfortable and safe access to endoscopic services. All gastroscopy and colonoscopy procedures are provided anesthesia from a board-certified anesthesiologist for your safety and comfort.